From 2012-2013, I had the privilege of serving in a voluntary capacity as church archivist for the Congregational Church of Needham. 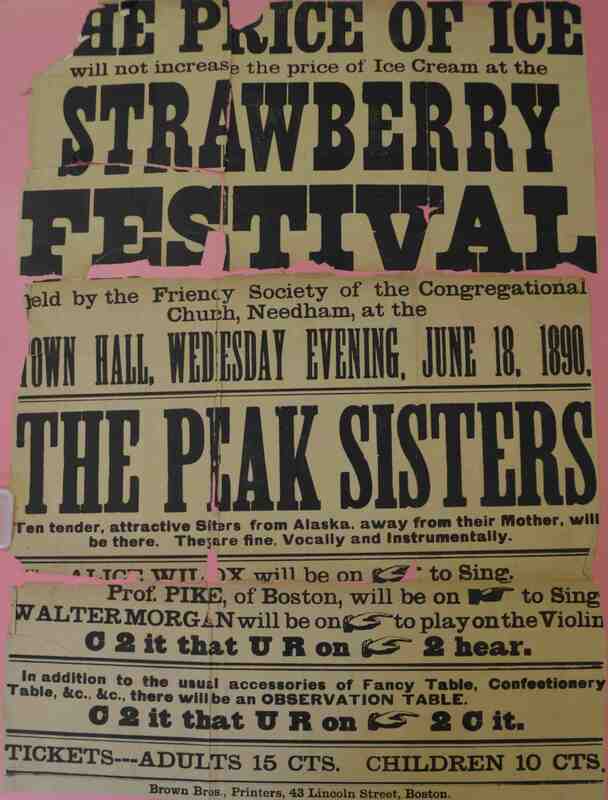 Early on in my stint, I came across this wonderful poster advertising the church’s 1890 Strawberry Festival. Some years ago the crumbling original had been glued onto a piece of pink poster board in an effort to stabilize it against the ravages of time. This wonderful document prompted so many questions. What was the price of ice in 1890, and why was it so high that it put the entire festival in jeopardy? How could this festival have been hosted by the Friendly Society in 1890, when the church’s Friendly Society didn’t get going until the mid-1930s? Who are the Peak Sisters? And what were they doing in Needham, Massachusetts? And what’s up with that texting shorthand, some 100 years before texting would take off in earnest? I just had to know. So I started a blog, Once Upon a Time in Needham, so I would have an excuse to find out. Now that our move to Chicago has put an end to my tenure as volunteer archivist, I’m slowly migrating the best of my posts from my archivist blog here to BostonWriters in an effort to consolidate my web footprint. You can find the entire collection of posts here, or just kick back and let them flow in over time. Next How could the Friendly Society have staged the 1890 Strawberry Festival when they’ve only been around 79 years?